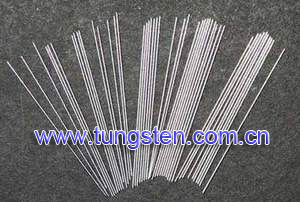 Tungsten needle is widely used in the construction of furnace tooling and parts and as a feedstock for the fabrication of parts for the electronics and semiconductor industries. Surface can be supplied in a shiny or matte; dependent upon thickness and width parameters. Tungsten needles grown from hexacarbony tungsten vapors in a glow-discharge condition are described. The needle growth occurs on a tungsten substrate in a temperature range from nearly room temperature to 1500 °K, but needles produced below and above ~1100 °K are quite different in morphology and crystalline state. The products at lower temperatures are tungsten particles agglomerated in dendrite like shapes while those at higher temperatures possibly are whiskers. Tungsten needle is a method and apparatus for performing electrosurgery with an ultra-sharp electrode composed of a refractory alloy, said electrode having a blunt end and a tip end, and a method for forming the ultra-sharp electrode by rotating about its axis a vertically held cylindrical rod composed of a refractory alloy and repeatedly withdrawing and replacing the rod into a pool of molten oxidizing agent. Tungsten needles have much finer tips. They are mainly used for scribing marks on metal surfaces, cutting particles from collodion and for single particle manipulation. Because the tip is rather fragile, it bends or breaks frequently. Many of these needles should be kept on hand since a few may be necessary to complete manipulation of a single particle. Not only are tungsten needles used for particle manipulation, but they can also be used when working with embryos and for glass blowing.